For years, business structured itself around strong leadership making intuition-based strategic decisions. Data, while useful, often found itself sitting on the sideline. Now, the ability to gather data and use it to make smart decisions is more powerful and useful than ever before. Retail strategy can now rally around decisions that come from consumer behavior rather than a gut feeling. Here’s how to develop a successful strategy that uses big data and advanced analytics in an accurate and organized way. Before you can begin to utilize analytics, you have to ask yourself a fundamental question: what will my business look like with data driving decisions? It might mean exploring avenues that seem counterintuitive or unusual. Go into the experience with an open mind. If you can imagine the day in the life of a data driven organization the possibilities are limitless. The DELTA method can be helpful when evaluating your business’s ability to manage and collect data effectively. Data: Collecting large amounts of data, and figuring out the best way to use it is key. Ask yourself — where is it being collected, and who or what is collecting it? Enterprise: Does your business have the infrastructure and capacity to manage data? If not, Intel can help. Leadership: Is your company’s leadership on board with the idea of data-driven decision-making? Target: Analytics doesn’t have a purpose unless it’s targeted towards measurable goals. What are short and long term goals that will help your organization’s bottom line? Analysts: Do you have the talent necessary to understand analytics and provide good insight? Do they have the ability to understand, decipher and publish often ambiguous terms used to describe data used to drive decisions (ex. shelf cost)? The transition from a gut or intuition-based model for decision-making can be tough, but there are ways to argue for the shift. Hitting stakeholders hard and fast with how data can radically change everything might be the truth, but sometimes you need to take a bit more practical approach. Business practices take years to shape and can’t always be expected to change overnight. We recommend couching the shift in a story. Has there been a moment within recent business history that might have been improved by data analytics? Take that and use it as an example of how data collection might have transformed into a tool that would have led to a more positive outcome. Then use that to visualize how data-driven decisions can be made a year from now based on what you can deliver. Once you’ve opened the door for an analytics-guided strategy, you have a model and infrastructure in place to effectively and insightfully manage inventory, supply chain, customer satisfaction, and many other operations. 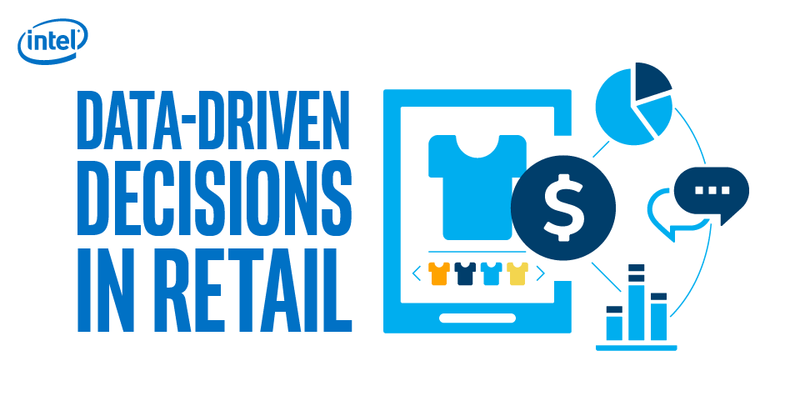 Successful retailers are using smart analytics for price optimization, recommendation engines and many other uses. Not sure about where to begin your smart analytics journey? Intel provides the tools to power whatever data analytics solution you choose. Your business’s story just got an upgrade.